As a method of robot movement, legs have the advantage of traversability on rough terrain. However, the motion of a legged robot is accompanied by energy loss. The main causes for this loss could be negative work and contact between the legs and ground. On the other hand, animals with legs are considered to reduce energy loss by using the elasticity of their body. In this study, we analyze the influence of walking, using an elastic passive joint mounted on the trunk of a quadruped robot, on the energy loss. Additionally, we study the energy flow between legs and elastic components. In this study, we clarify a control method for quadruped robots in order to reduce the energy loss of walking. The results of simulating a quadruped walking robot, which has passive joints with elastic components on the trunk, are analyzed and the relationship between each kind of energy loss and the trunk joint’s elasticity is clarified. M. Ikeda and I. Mizuuchi, “Analysis of the Energy Loss on Quadruped Robot Having a Flexible Trunk Joint,” J. Robot. Mechatron., Vol.29, No.3, pp. 536-545, 2017. A. Ruinaa, J. E. A. Bertramb, and M. Srinivasana, “A collisional model of the energetic cost of support work qualitatively explains leg sequencing in walking and galloping, pseudo-elastic leg behavior in running and the walk-to-run transition,” Int. J. of Theoretical Biology, Vol.237, No.2, pp. 170-192, 2005. A. R. McN, N. J. Dimery, and R. F. Ker, “Elastic structures in the back and their role in galloping in some mammals,” Int. J. of Zoology, Vol.207, No.4, pp. 467-482, 1985. R. M. Alexander, “Gaits of Mammals and Turtles,” J. of the Robotics Society of Japan, Vol.11, No.3, pp. 314-319, 1993. H. M. Herr, G. T. Huang, and T. A. McMahon, “A model of scale effects in mammalian quadrupedal running,” J. of Experimental Biology, Vol.205, No.7, pp. 959-967, 2002. A. R. McN, “Three uses for springs in legged locomotion,” Int. J. of Robotics Research, Vol.9, No.2, pp. 53-61, 1990. J. Pratt, “Towards Understanding Simple Open Loop Models of Fast Running,” Dynamic Walking 2014, 2014. S. Seok, A. Wang, M. Y. Chuah, D. Otten, J. Lang, and S. Kim, “Design principles for highly efficient quadrupeds and implementation on the MIT Cheetah robot,” 2013 IEEE Int. Conf. on Robotics and Automation (ICRA), pp. 3307-3312, 2013. D. J. Hyun, S. Seok, J. Lee, and S. Kim, “High speed trot-running: Implementation of a hierarchical controller using proprioceptive impedance control on the mit cheetah,” The Int. J. of Robotics Research, Vol.33, No.11, pp. 1417-1445, 2014. S. Kim, J. E. Clark, and M. R. Cutkosky, “isprawl: Design and tuning for high-speed autonomous open-loop running,” The Int. J. of Robotics Research, Vol.25, No.9, pp. 903-912, 2006. A. Ming, K. Sato, R. Sato, E. Kazama, I. Miyamoto, and M. Shimojo, “Development of robot leg composed of parallel linkage and elastic spring for dynamic locomotion,” 2015 IEEE Int. Conf. on Information and Automation, pp. 38-43, 2015. R. Sato, I. Miyamoto, K. Sato, A. Ming, and M. Shimojo, “Development of robot legs inspired by bi-articular muscle-tendon complex of cats,” 2015 IEEE/RSJ Int. Conf. on Intelligent Robots and Systems (IROS), pp. 1552-1557, 2015. T. Takuma, M. Ikeda, and T. Masuda, “Facilitating multi-modal locomotion in a quadruped robot utilizing passive oscillation of the spine structure,” 2010 IEEE/RSJ Int. Conf. on Intelligent Robots and Systems (IROS), pp. 4940-4945, 2010. T. Takuma, M. Ikeda, and T. Masuda, “Development of 3D Quadruped Robot with Animal-like Trunk and Leg Mechanisms,” The 5th Int. Symposium on Adaptive Motion in Animals and Machines (AMAM2011), pp. 73-74, 2011. K. Narioka, A. Rosendo, A. Sproewitz, and K. Hosoda, “Development of a minimalistic pneumatic quadruped robot for fast locomotion,” 2012 IEEE Int. Conf. on Robotics and Biomimetics (ROBIO), pp. 307-311, 2012. 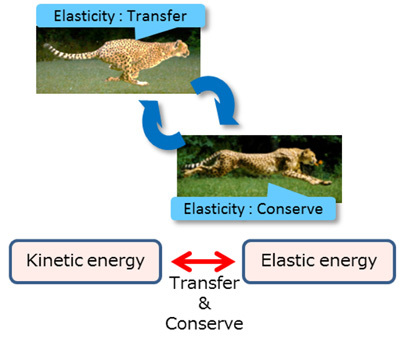 Q. Cao and I. Poulakakis, “On the Energetics of Quadrupedal Bounding With and Without Torso Compliance,” IEEE/RSJ Int. Conf. on Intelligent Robots and Systems (IROS), pp. 4901-4906, 2014. R. M. Alexander, “The gaits of bipedal and quadrupedal animals,” The Int. J. of Robotics Research, Vol.3, No.2, pp. 49-59, 1984. R. V. Ham, B. Vanderborght, M. V. Damme, B. Verrelst, and D. Lefeber, “Maccepa, the mechanically adjustable compliance and controllable equilibrium position actuator: Design and implementation in a biped robot,” Robotics and Autonomous Systems, Vol.55, No.10, pp. 761-768, 2007. K. F. Laurin-Kovitz, J. E. Colgate, and S. D. Carnes, “Design of components for programmable passive impedance,” Proc. of 1991 IEEE Int. Conf. on Robotics and Automation, pp. 1476-1481, 1991.